Wildcat Electric Supply carries a broad range of Fluke products. Click here to request a quote or ask about Fluke solutions or call 713-676-0600. A wholly owned subsidiary of Fortive Corporation (NYSE: FTV), Fluke is a multi-national corporation headquartered in Everett, Washington, USA. Manufacturing centers are located in the USA, the UK, Asia and The Netherlands. Sales and service subsidiaries are located in Europe, North America, South America, Asia and Australia. Fluke Corporation has authorized distributor and manufacturer representative channels in more than 100 countries and employs approximately 2,400. Market Segments The Fluke product lines are beneficial for professionals in a variety of markets. Primary segments are listed below, and include a brief description of the types of Fluke tools used along with their typical applications. Industrial/Electronic Service Installation and Maintenance Today, electronics are integrated into an increasing number of electrical and electro-mechanical systems. 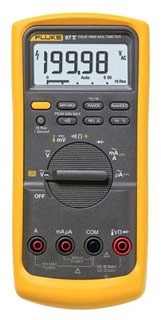 Fluke's comprehensive line of digital multimeters, electrical power analyzers, thermal imagers, insulation resistance testers, accessories, plus the integrated ScopeMeter™ handheld test tools, are being used by a growing number of service technicians, plant engineers and installation and maintenance technicians. These tools provide them the ability to troubleshoot these complex new systems and detect problems quickly.